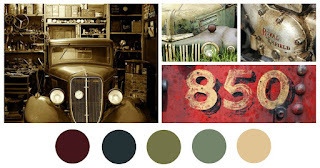 So this take over the blog post is going to be downright honest and truthful and I am going to share a project that I like now but originally I was not a fan of, and I am going to tell you all why. I started with a Kraft envelope and using the Raisin Boat Cherry Blossom stamp set (10149-Z) I colored the stamps with water color pens and spritzed them with lots of water, I then stamped them down around the address area I had doodled around with a thin black pen. Isn't this stamp pretty and look at how unexpected my results are, I mean they are Cherry Blossoms but are so undefined and ethereal, fun right? I moved the stamps all around and continued adding water colors to the stamps, spritzing with water and stamping down. I then set that aside to dry. 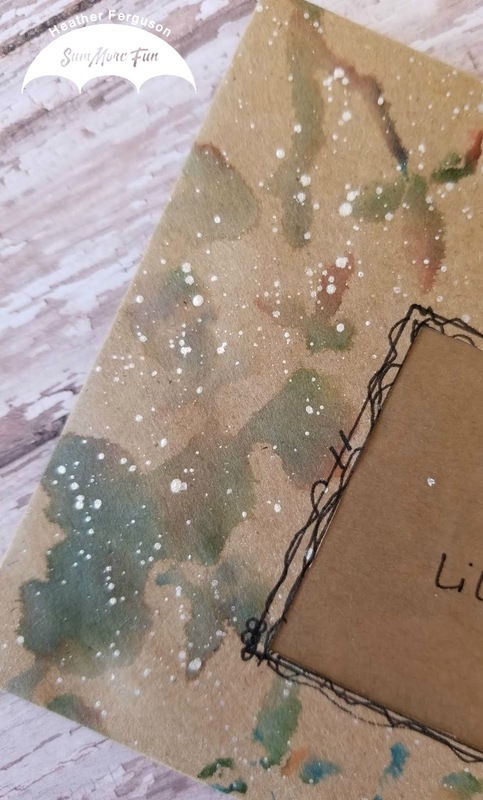 When it was dry I took some Perfect Pearls in the color Perfect Pearls and added some water to an acrylic block, mixed them together and then flicked them onto the envelope. I then added my "To" address (I do have permission from the recipient to use her address) and this is where things took a turn..... I hated my handwriting and messed up the address, so I tried to fix it and it just got worse. But I did not want to throw away the envelope, I liked it. So I took an exacto knife and cut out the address portion. I know right? Crazy! So then I took a piece of acetate and backed the window like I would a shaker card or window envelope and it was better and then I re-doodled the lines around the window. 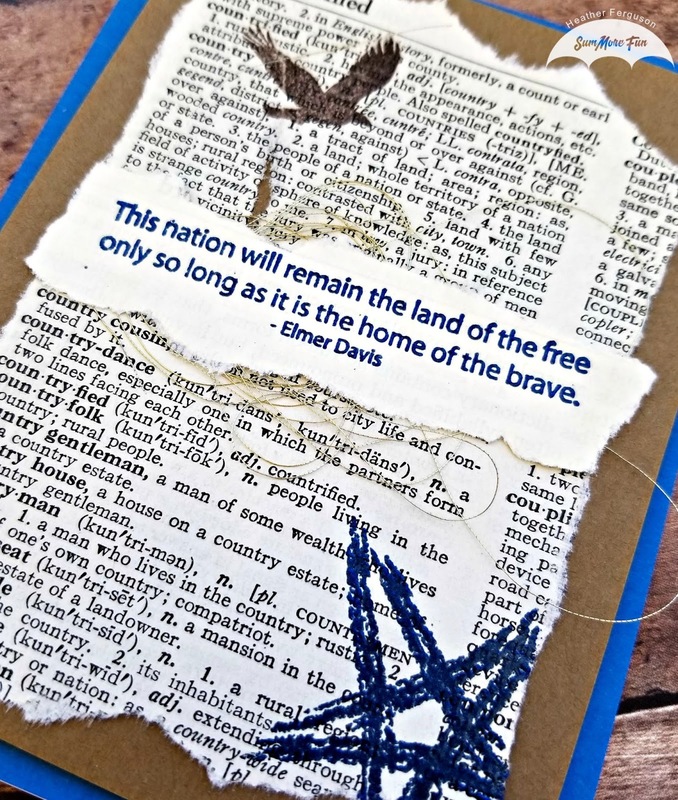 I then took a piece of Kraft card stock and re did the "To" address and when I was happier with it I attached it to the inside of the card. To finish it all off, because I really am going to mail it, I needed a stamp. And I have an abundance of stamps because I LOVE them and when the post office releases new ones I am generally right there in line adding to my supply. 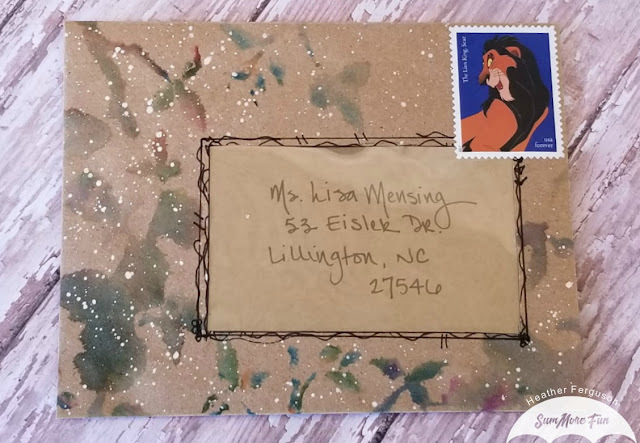 So the other thing is I try to match stamps on my cards to the recipient, and this recipient is a fan, ahem, FAN of Disney, the stamp does not necessarily match the watercolor flowers, except the brown colors, maybe, sort of.... but I decided to stick with my decision. And that was the next area I was a little unhappy with, until I started to really think of why I was making the envelope, who I was sending it to and the fact that any kindness or thought of another is generally what makes people smile and gives them happiness. 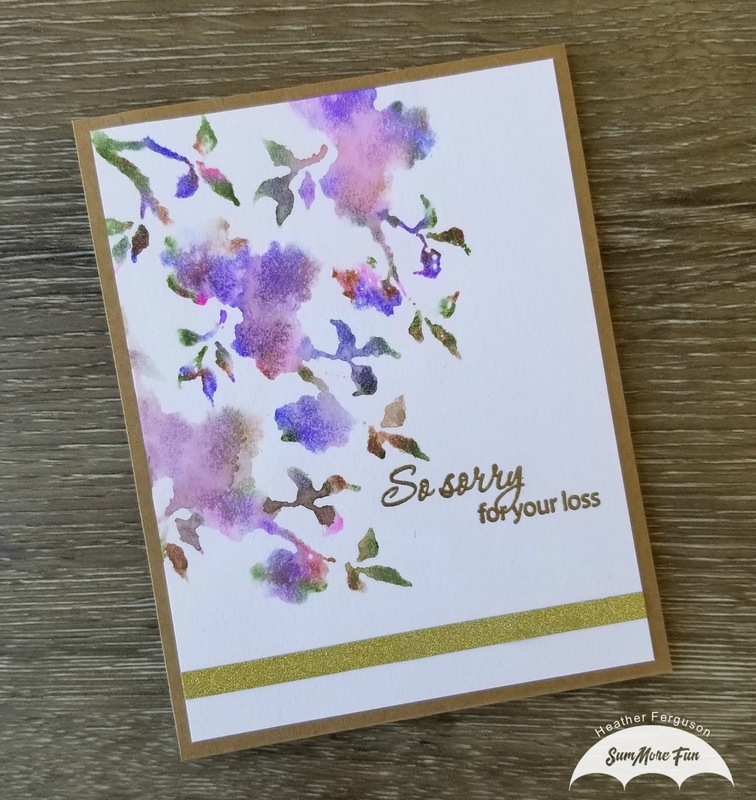 So although it is not "perfect" and I see the "flaws" I reevaluated and I like it after all, it is real and shows the true reason I got into card making, sharing a smile and a thought and a bit of happiness. Because in the end who does not like to get happy mail in their box whether I see an "issue" with it or not, because generally speaking we are our own worst critics and maybe just maybe it was me stepping out of my crafty box and just feeling like it was so different from my normal that it wasn't good enough or perfect. So this Saturday I wish you all patience with your self and your talents and joy that you create and that whatever you create or share is perfect and special and appreciated, no mater what your little inner voice tells you, you rock! I started with a white A2 side-fold card base and then layered some Kraft card stock that was cut to 4 1/4" x 5 1/2" on top. To give it some dimension I added fun foam to the back of the Kraft before placing it onto the card base. 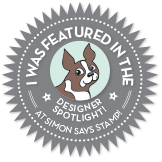 I then set this aside and worked on my stamped top piece. For the stamped panel I used some white Mixed Media paper and placed the large blossom and branch stamp from the Raisin Boat Cherry Blossom (10149-Z) set into my MISTI and using water color markers I inked up the stamp, spritzed with water and stamped down. I held the stamp down so the ink could soak into the paper and then I cleaned the stamp and re positioned the stamp two more times and using the water markers did the same steps. 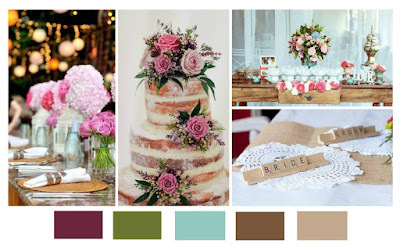 I used a darker pink, two purple colors, a dark green and a brown marker to go with the mood board colors. I then stamped a sentiment from the Raisin Boat Flourishing Thoughts (10271-Z) stamp set in Versamark Ink and heat set with Gold Embossing powder. I then used a thin strip of gold glitter washi from my crafty stash and placed that at the bottom of the panel and finished it off by gluing the panel to my already made card base. I am working to get my card stash replenished and although I do not need a sympathy card now I know when and if I do I will have one. 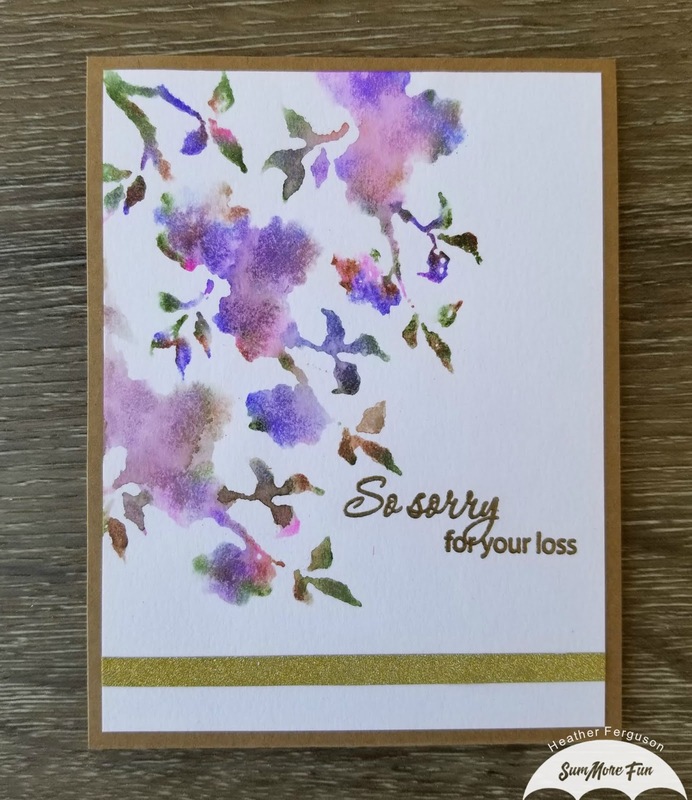 I do believe these are some of the hardest cards we have to design but that when a friend or loved one loses someone it is so important they know they are thought of and loved. 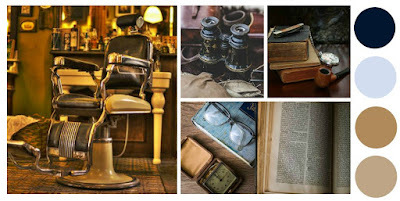 I do hope you will all join us on the current challenge, I have linked it below and I thank you for stopping by, see you all soon. It is my day to take over the blog at SumMore Fun and I went for a fun, summer time vibe with my card. So let's check it out. I started with a white piece of card stock cut to 4" x 5 1/4" and stamped the "Bug" stamp with some Archival Red Geranium Ink. I am using the Raisin Boat Off to Party (10003-Z) stamp set and corresponding sentiments. I then colored in the bumper area and tires with a black fine tip pen. Using Copic Markers in N0, N1 and N5 I colored in some pavement adding some dot details to where the tires would have driven. I found some black glitter washi tape and some black and white grid washi in my stash of crafty supplies and added that to the bottom of the card. 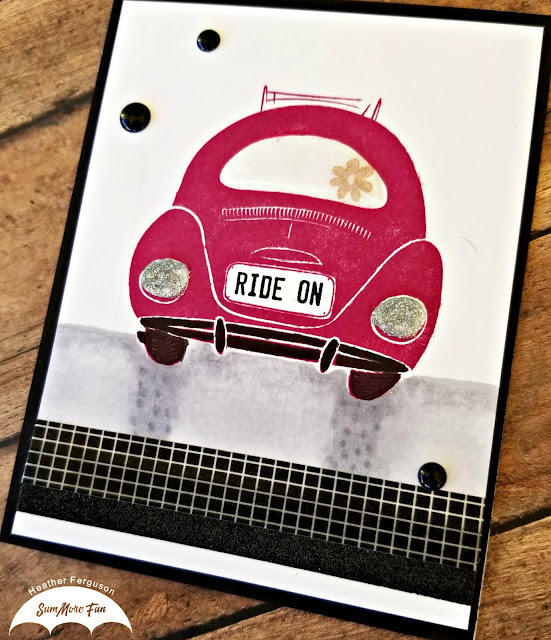 I then used the "Ride On" sentiment in the set to stamp on the license plate in black ink and the little flower stamp onto the back window in gold ink. I added the panel to a piece of black card stock cut to 4 1/4" x 5 1/2" and then added that to a side folding white A2 sized card base. 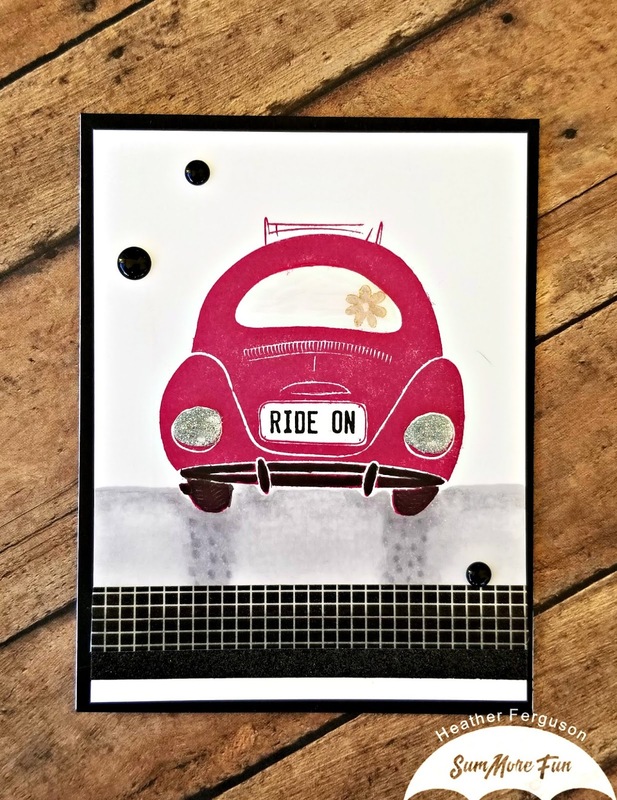 To finish my card I added some black enamel dots in small and medium and then used my Silver Moondust Nuvo Crystal Drops on the tail lights and a coating of Grey Mist Translucent Nuvo Jewel Drops over the back window. I set it all aside to dry for 24 hours and that finished off this card. See you all soon! Thanks for stopping by. 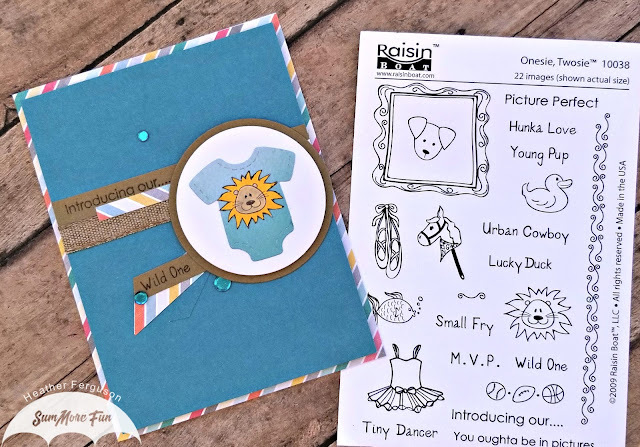 It is my day to take over the blog and I am so excited to share this adorable baby card with you. I started with a 4 1/4" x 5 1/2" card base using some cute striped pattern paper, I then cut down a piece of blue card stock to 4" x 5 1/4" and popped it up with some fun foam. I layered some burlap ribbon, striped card stock and my "Introducing our...." sentiment stamped onto Kraft card stock onto the blue paper. I then cut a circle out of Kraft card stock and then a smaller circle out of white and placed fun foam between the layers to give it some added dimension. 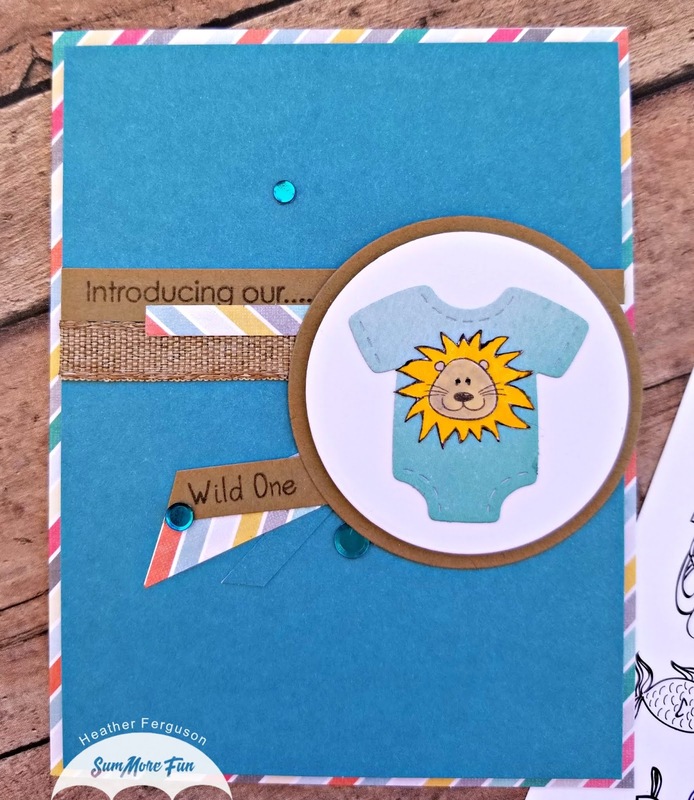 I then cut out a cute little onesie in blue ombre colored card stock and then stamped the adorable lion from the "Onesie, Twosie (10038-Z)" Raisin Boat stamp set onto some white card stock. I colored him in with my Tombow markers and then fussy cut him and laid him onto the onesie. I added some glitter to the mane and some black glaze to the eyes. 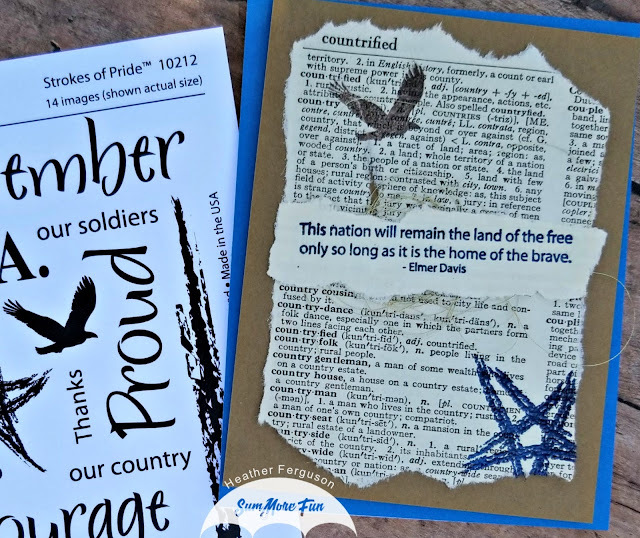 I stamped the "Wild One" sentiment onto another piece of Kraft card stock and then made a little banner with some blue paper and striped paper and put that behind the focal point. To finish it off I added a few confetti sequins in blue in different sizes and my card is complete. 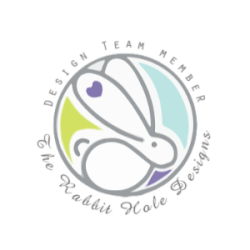 Our current challenge is still up, I have attached the link below for you to join us and the stamps I have used are listed below. Thank you all, see you soon!